Your 9th month has been quite an adventure for you. You broke your finger, learned to walk, added more words, and got to come with Mom and Dad to the Essential Oil Convention in Salt Lake City. You had your 9 month baby appointment on September 11th, and all four of us went (it was Daddy's day off). You did great, even though you didn't appreciate the shots, and we went home for a calm day of cuddling after that. In the evening, you got into the open pantry while we were making dinner, and you knocked a class jar off of a shelf. It landed on your pinky finger and, oh my baby, that's one of the scariest times I've been through. Your little finger turned purple and swelled to more than twice its size. I tried to calm you by nursing you so that we could ice your finger, but you could not stop screaming. We swiped some oils on your finger to help with the swelling, put a few more oils on you to help calm you, and then I put you in your car seat and drove to Urgent Care while Daddy stayed behind to put Kayleigh in bed. We are 45 minutes away from the closest Urgent Care our insurance will cover (got to change that!!!) so I was so glad when you fell asleep on the drive. When we got to the hospital, I woke you up and carried you in. You were smiling and waving to everyone while I was trying to check you in, and when the doctor came in to see you, you tried to give her a high five with your injured hand! I was starting to think that maybe I was crazy for bringing you in since the swelling was down, the color was better, and you were clearly not in the significant amount of pain you were when we were at home. But sure enough, after the Xrays came back, the doctor told us that your finger was broken. I was so sad for you! But wow...what a testimony to our good God and these amazing oils. We applied oils to your finger for two weeks, but you stopped acting like it bothered you after just a few days. Praise God! Another big excitement (much more positive) was that you got to join us for the Convention. Kayleigh stayed behind and spent time with Grammy, Papa, YiaYia, and Ami, but you got to brave the 10 hour drive up and the 4 days of being whisked around from one event to the next. You were a trooper, though! I made a different shirt for you to wear for each day of the Convention, and you stole many hearts with your big smiles and happy waves. "I hit SILVER in my sleep!" 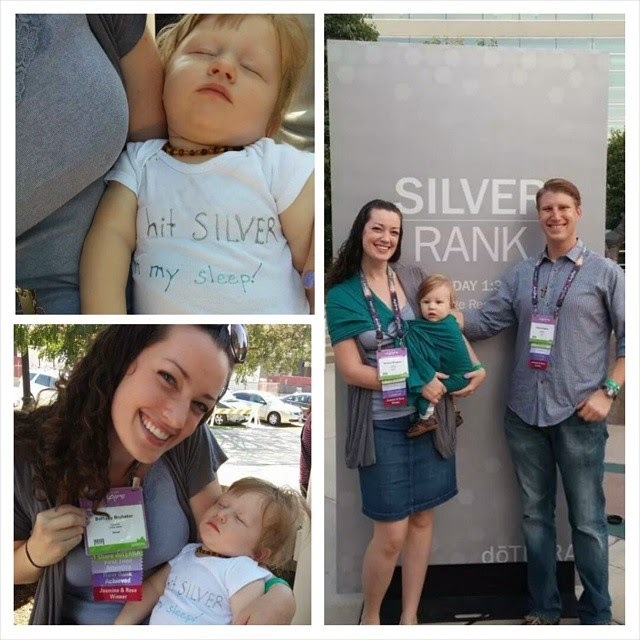 It felt very full-circle to reflect about how my pregnancy with you is what got us started on our essential oil journey, and while at Convention, you got to go across the stage with us celebrating our achievement as Silvers. September was also the first time you got to go to Bible Study Fellowship as a participant. Last year, I wore you in the Ergo and took you to my class, but this year, you got to go to your own class. I was anxious about the thought of leaving you with people you do not know (since you have given several loved ones very difficult times when we leave you behind to go on a date) but you've been a champ at BSF! I think it has to do with the fact that there are so many other babies there and that you're such a social little person. You seem to love it, and I'm so thankful for that! We love you so much, Logan Mark. So, so much. Nicknames: Boyo, Little Man, Logan Mark, Puppy, and whatever character Kayleigh decides you are for the day. 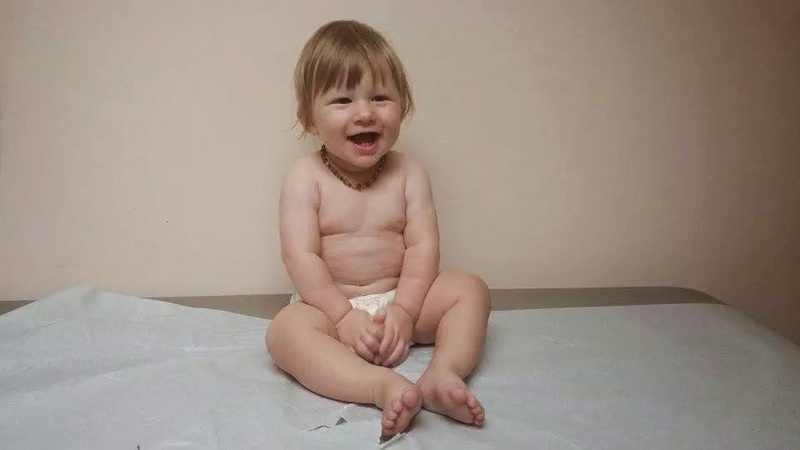 Temperament: Happy happy, except when teething or tired. Things I Could Do Without: Broken bones! Never again, ok? Things You Could Do Without: You don't seem to mind when we tell you not to do something. You just smile and wave and keep on doing it. Hopefully that changes soon! Item/Toy We Love The Most: We bought a diffuser for your room, and we love it! You're sleeping better now, and we. are. so. thankful. Things I'm Loving Most Right Now: You wave at everyone and say "Hiiiiiiiiiii!" in a very high pitched squeal. It always makes people smile. Things You're Loving Most Right Now: Playing Peek-a-Boo, holding onto something flat and scooting it across the floor while your propel yourself with your legs. You are FAST! Sounds/Words: You say "a-doo" when playing Peek-a-Boo, and it's absolutely adorable! Also Mama, Dada, hi, bye, and tap. Foods You Like: You will eat anything we give you. Chicken, pasta, cooked vegetables, fruit...you love it all. Milestones: First steps! Like a true mom of two, I didn't write down the day you took your first step, but you took it here at our house with Mommy and Daddy both watching. It was so special! Last year while I was pregnant with Logan, I was horrifically sick with Hyperemesis Gravidarum. The medication I was on so that I could just keep down sips of water was giving me awful migraines. The pain from the migraines made me so miserable, and Tylenol just wasn't cutting it. I started searching for something else. There must be something else! I was desperate. I bought a raw Baltic amber necklace. I told my husband that I was ready to pay for a rain dance if someone told me it would help my headaches go away. And then a friend told me that someone was coming over to talk with her about using Essential Oils for her daughter's growing pains...and maybe there would be something for my headaches, too. I was familiar with Essential Oils. My mom had sworn by Tea Tree oil for every cut, scrape, and bug bite we ever got as kids. I had a bottle of Lavender oil that I had bought at (gasp) Target and used to make my Natural Postpartum Gift Set that has brought a lot of traffic to my blog. But mostly, essential oils were just used in my home as a natural alternative to chemical-filled household cleaners. I had rid my house of all of those when Kayleigh was born, only using vinegar, baking soda, and essential oils for the past two years. Instead of finding one simple quick fix at the class that night, Jesse and I were completely amazed to learn how truly impacting Essential Oils can be to every aspect of our life. We walked out that night with a whole new outlook on our healthcare. Essential Oils are now our way of life. I'm so thankful that I can care for my little ones at home instead of having to run to the doctor for every little thing. What a difference that makes! Instead of feeling helpless as parents when our children are not at their best, Jesse and I are empowered. We have spent the last year researching articles, learning from others who use Essential Oils, listening to experts in the field, and using our oils every day. Essential Oils are just too wonderful to keep to ourselves. Jesse and I are excited to launch our new website, New Leaf Essentials, and are looking forward to sharing more about these amazing natural solutions with you!